Bounce on a golf club is measured in degrees. Sand wedges have the highest degree of bounce of any club. Golfers generally know that the loft of a club helps get the ball in the air. 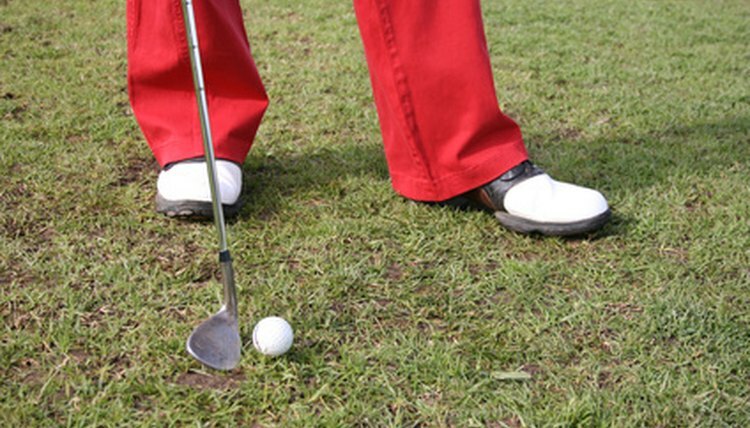 But bounce, which according to "The Sand Trap," is the angle of the sole against the ground at address, is just as important to a good golf shot as loft. The higher the degree of bounce to a club, the better it runs over the ground rather than cutting into it. Like loft, the bounce of a club is measured in degrees and wedges have higher bounce than long irons. Clubs with bounce of less than 8 degrees are considered "low bounce" wedges, according to Publinks Golfer. Lob, pitching and gap wedges usually have the lowest bounce of all wedges, making them a good selection for tight lies, wet sand and hard turf. Low bounce translates into less opportunity for hitting a shot thin, as the sole of the club should sweep over the surface, rather than cut into it. In general, lob wedges have 0 to 10 degrees of bounce, pitching wedges have 2 to 5 degrees of bounce and gap wedges have 5 to 12 degrees of bounce, according to Learn About Golf. Clubs with a bounce of more than 10 degrees are considered "high bounce" wedges, according to Publinks Golfer. Sand wedges and some specialty gap wedges usually have high bounce, making them a good choice for light sand, deep rough or a shaggy fairway. Because the angle of the swing will be steeper, the high bounce allows the club to slide over the surface and create the opportunity not only for clean impact, but also height on the shot. Sand wedges have the most amount of bounce of any wedge, usually between 10 and 16 degrees, according to Learn About Golf. Specialty gap wedges may have as much as 12 degrees of bounce, though most are lower. Not usually recommended for the casual golfer, wedges with "tour sole" bounce were created for low-index players and touring pros, who traditionally play on close-cut fairways and firm sand. The soles of these clubs have had some bounce removed from the heel and the toe of the club, as high-level golfers have the advantage of making a clean swing nearly every time. Lob wedges, which require precision, usually have the lowest bounce, as little as 0 degrees, of any wedge, according to Learn About Golf. These clubs, and others with tour soul bounce leave little room for error, but allow a golfer to make a full swing while popping up the ball.